A space to come together with friends around a fire without having to leave the city: an idea to fulfill a personally fantasy of mine, was able to (slightly) come to fruition with a class project from Graphic Design I. The assignment was to create a company to expand our logotype and branding skills. A strong component of this project was to create a logo from a recognizable object that would represent the brand clearly. Embers is an urban space to enjoy the nostalgic feel of a fire similar to the feel of an old lantern. Gathering around a lantern and a fire elicits a feeling of warmth and comfort, which is what I want Embers to bring to people in an urban area. Capturing the image of the lantern was very important to the brand of Embers. The shape needed to be familiar and recognizable. This is the second lantern I photographed and just one of many photos I took. 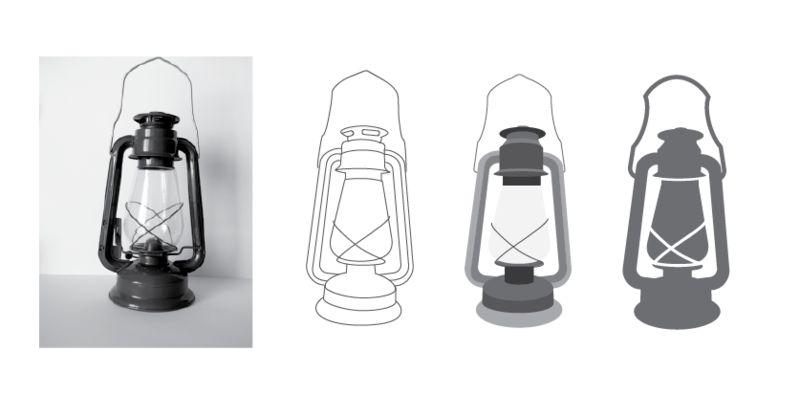 I created many iterations of the drawing of the lantern, finally picking one that could be drawn using one color. I decided on putting the shape of the lantern into a circle to resemble the light that is illuminated by the lantern. The circle also creates the same inclusive feeling that a group of friends huddled around a fire or lantern might feel. Ending with a brand that felt contemporary, but with a strong nostalgic side, I wanted the overall feel to fit into a city setting while still retaining a camping vibe. The colors and typefaces were chosen to matched that feeling.